Do all objects continually emit electromagnetic (EM) radiation? Which surfaces are the best emitters/absorbers of EM radiation? Why does the Sun emit more higher frequency EM radiation than the Earth? What has the emission and absorption of EM radiation to do with global warming and the greenhouse effect? All objects are constantly emitting electromagnetic (EM) radiation over a range of frequencies depending on the temperature of the material. At the same time, the same objects are constantly absorbing EM radiation. At low temperatures, most of this absorbed or emitted radiation is in the infrared EM waves range. glow red e.g. the hot elements of an electric fire (> 550oC), the red glow gets more intense up to ~950oC. and at very high temperatures objects will emit ultraviolet light e.g. burning magnesium ribbon flame (~2200oC, plus lots of infrared and obviously visible light too!). The EM radiation emitted or absorbed depends on the material and its temperature. A hot cup of tea on the table will radiate more infrared than it absorbs, it will give out a net transfer of heat until, on cooling, it reaches the ambient room temperature. The heat transfer still involves conduction and convection but the statement as regards EM radiation is still valid. When the rate of an object's emitted radiation = absorbed radiation, it means the object is at the same constant temperature as its surroundings. The input and output radiation balanced, no increase or decrease in temperature, it stays constant. A piece of bread when placed in a toaster is cooked as the temperature rises by infrared heat absorption. Other cases might involve heat transfer by conduction and convection but the statement as regards EM radiation is still valid. So the rule is - when an object that is hotter (higher temperature) than its surroundings, it will emit more radiation than it absorbs, and, an object that is cooler than its surroundings will absorb more radiation than it emits. The power (P) per unit area is a measure of the intensity of radiation (units e.g. W/m2). so here the intensity of EM radiation can be expressed as the rate at which energy is emitted per unit area. Reminder - all objects are constantly emitting electromagnetic (EM) radiation over a range of frequencies depending on the temperature of the material. The distribution and intensity of emitted wavelengths only depends on the temperature. An object that absorbs ALL radiation falling on it, at all wavelengths (or frequencies) , is called a black body - the 'perfect' or 'ideal' absorber of EM radiation. When a black body is at a specific uniform temperature, its emission has a characteristic wavelength (or frequency) distribution that depends on the temperature. Its emission is called black-body radiation - the 'perfect' or 'ideal' emitter. Most objects reflect light to some extent. Graphite powder can absorb 97% of incoming radiation and I assume it can emit 97% of black body radiation? There is military interest in blackbody-like materials for camouflage and radar-absorbent materials for radar invisibility - the idea is to avoid detection from reflected or emitted EM radiation. Graphene nanostructure materials have been made with almost perfect black body properties. Artists are interested in these graphene materials to produce the perfect black surface. The intensity of emission for particular wavelengths/frequencies depends on the temperature of the object. The effect of temperature on the intensity - wavelength distribution is shown graph 'sketch' 1. Note that ALL intensities increase in value for all wavelengths with increase in temperature. T4 could represent a very hot star, the surface of our Sun is ~6000oC, so we get lots of visible light, and lots of ultraviolet radiation if it wasn't for the ozone layer! The wavelength with the highest intensity ('peak') of emitted radiation is called the principal wavelength. The higher the temperature of an object the greater the intensity of every emitted wavelength. Looking at graph 1 you can see that the intensity increases much more for shorter wavelengths (higher frequencies) than longer wavelengths with increase in temperature. This is because shorter wavelength EM radiation transfers more energy (*). This results in the principal wavelength being decreased (gets shorter) the higher the temperature. Therefore as objects get hotter the principal wavelength gets shorter and the intensity distribution gets wider and less symmetrical. The effect of temperature on the intensity - frequency distribution is shown graph 'sketch' 2. Note that ALL intensities increase in value for all frequencies with increase in temperature. The frequency showing the greatest intensity ('peak') of emission is called the principal frequency. The higher the temperature of an object the greater the intensity of every emitted frequency. The principal frequency increases with increase in temperature of the object. This means, as already stated, the principal wavelength of greatest emission intensity decreases with increase in temperature. Astronomers use spectral data to identify elements in distant stars BUT can also use the wavelength/frequency distribution and intensity to work out the temperature of a star. A hotter star will have a greater principal frequency (shorter wavelength) than a cooler star. Although objects are constantly absorbing and emitting radiation, not all the radiation is absorbed because some of it is reflected away. The nature of the surface of any materials affects the relative amounts of radiation absorbed or emitted. Dark, matt surfaces are the best absorbers and best emitters of infrared radiation eg rough black surfaces. Solar panels for hot water comprise of pipes carrying water to be heated set under a black surface to efficiently absorb the infrared radiation from the Sun. Hot water radiators should have a matt surface, preferably black, but rarely so - they don't look very attractive! Black matt surfaces are the nearest thing to a black body radiator and emitter. Light, shiny surfaces are poorest absorbers and poorest emitters of infrared radiation eg white gloss paint, silver surface used in vacuum flask ('thermos flask') to minimise heat transfer by infrared radiation. Light, shiny surfaces are good reflectors of infrared radiation, this maybe to keep heat in to keep things warm or to minimise heat radiation in to keep things cool eg a vacuum flask. You set up four identical pyrex glass boiling tubes in a test tube rack. Each is covered by wrapping around the boiling tubes the same area of paper of different textures. Each is filled with the same volume of boiling hot water and lightly seal with an insulating rubber bung. At regular time intervals e.g. every minute, remove the bung and measure the temperature. This fits in with the described pattern of behaviour described above. Doing cooling curve graphs is a better data analysis than just one set of readings. The Leslie cube is a hollow aluminium or steel metal can with four different surface coatings on the four vertical sides. e.g. matt and gloss black paint, matt and gloss white paint, or other surfaces like shiny and dull metal surfaces. The cube needs to be made of a good conductor so the surfaces heat up rapidly. An infrared (thermal radiation) detector is positioned in line with the middle of a surface of the cube and connected to some kind of meter or data logger. The Leslie cube is filled with boiling hot water - take care! The can is given a few minutes to warm up all the surfaces - all will come to the same temperature (fair test). The thermal radiation reading is taken for all four faces of the Leslie Cube, making sure the distance between the Leslie cube and detector is kept absolutely constant to make it a 'fair test'. The higher the 'meter' reading, the greater the intensity of radiation emission and the more efficient the surface in heat transfer by thermal radiation (infrared). The ideas about surfaces (above), and those introduced about wavelength/frequency in section (a) can now be applied to considering the Earth's temperature. The overall temperature of the Earth depends on three factors relating to EM radiation. Reflection - how much of the incoming radiation is reflected by the clouds, land or water. Emission - how much of the absorbed radiation is re-emitted. 1. Reflection of the Sun's EM radiation from clouds. 2. Absorption of the Sun's EM radiation by clouds. 3. Re-radiated EM radiation totally escaping from the Earth's surface. 4. Direct absorption of the Sun's EM radiation by the Earth's surface - short wavelength as wells visible light and a little uv radiation. 7. Direct reflection back into space of incoming EM radiation from the Sun. Land coated in 'shiny' ice will act as a good reflector, so if it melts, more radiation will be absorbed. 8. Direct absorption by the atmosphere of the incoming Sun's EM radiation. During in daytime a huge amount of EM radiation is transferred to the Earth's surface and atmosphere. Some radiation is absorbed by the atmosphere but a lot passes through and absorbed by the Earth's surface. This warms up the surface and increases the temperature, particularly areas in bright sunlight. Overall more EM radiation is absorbed than is emitted. The reverse is true at night, when more FM radiation is emitted than is absorbed. The lack of sunlight causes a decrease in temperature, and the heat loss increases if the sky is clear, because some of the re-radiated EM radiation is absorbed or reflected back off clouds. It is also absorbed by greenhouse gases like carbon dioxide and methane. In terms of the amount of radiation that the Earth absorbs, emits and reflects, the net result is fairly constant temperature. It is neither too hot or too cold for many forms of life to survive. However, any significant changes in the Earth's atmosphere may cause the average temperature to change and currently it is believed (consensus scientific view) that global warming is taking place due to the increase in carbon dioxide levels due to fossil fuel burning. The greenhouse gases, principally, carbon dioxide (CO2), water vapour (H2O) and methane (CH4) absorb radiation in the Earth's atmosphere which allows the Earth to warm up. The relatively small concentrations of carbon dioxide and methane have a potentially a large and disproportionate effect on the Earth's average temperature - they are really good greenhouse gases! There is a net transfer of heat energy from the much hotter Sun to the much cooler Earth. In terms of frequency, the principal frequency of EM radiation from the Sun is much greater than that of the Earth. Although all particles (atoms/molecules) absorb particular frequencies of radiation from the Sun, the higher frequency radiation (particularly the infrared, IR) gets through to the Earth's surface (see diagram above). The higher frequency IR is not as readily absorbed by most molecules in the atmosphere and reaches the Earth's surface. The re-emitted infrared radiation from the Earth's surface is of lower frequency (longer wavelength) than the incoming IR radiation. It is the likes of carbon dioxide and methane (and other human-made molecules) that readily absorb the lower frequency radiation keeping the Earth warmer than if this radiation escaped. The more greenhouse gases in the atmosphere, the greater the absorption of the re-emitted IR radiation and the warmer the Earth gets and it is believed that human activity is contributing to this! In particular, it is the rising level of carbon dioxide from fossil fuel burning that is the most worrying and major contributor to global warming above what we might expect without burning fossil fuels. I've included everything mentioned in any GCSE chemistry or physics syllabus relating to the 'Greenhouse Effect'. Venus is the 2nd planet from the Sun and is named after the Roman goddess of love and beauty - perhaps because it shone the brightest of the five planets known to ancient astronomers - but looks can be deceptive, Venus has no love for the human body! 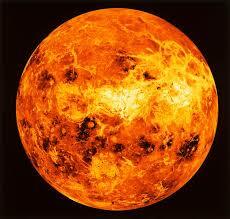 The surface temperature of Venus is up to 465oC. The surface atmospheric pressure is 90 atm (90 x that on Earth). The lower atmosphere is mainly carbon dioxide (96.5% CO2) and nitrogen (3.5% N2). The surface area and volume are about 0.9 x that of Earth. The surface of Venus is relatively flat but very volcanic with still some active volcanoes. The dense lower carbon dioxide atmosphere is encased in 80 km thick clouds of mainly sulfuric acid (H2SO4) and some sulfur dioxide (SO2) - these clouds reflect 90% of sunlight - which is why it seems so bright, as well as being closer to the Sun than the Earth. This reflection of sunlight would tend to make the planet cooler - a global dimming effect. BUT, the hot surface of over 460oC is a powerful emitter of infrared EM radiation. This thermal radiation is absorbed by the lower carbon dioxide rich atmosphere (96.5% CO2). This produces a super greenhouse effect compared to planet Earth (0.04% atmospheric carbon dioxide). Little (if any?) infrared radiation escapes from the planet's atmosphere. So the surface temperature is kept at a much higher temperature than if the infrared could escape and the net effect completely overrides the dimming effect of the outer reflective clouds. (a) Compared to Earth the surface temperature is much hotter - a much stronger emitter of infrared EM radiation AND the atmospheric carbon dioxide concentration is 2400 x that of Earth! - 2400 x the greenhouse effect of carbon dioxide gas on Earth! (b) The greenhouse effect on Venus is different to that on Earth in one respect - it doesn't actually involve the absorption and remission of infrared radiation - the infrared source on Venus is only from the hot surface.